Designs remain ideas on paper or visions in the mind until they are built. Designs also serve as a blueprint for construction as they are not simply visual graphics. Design drawings are supplemented with construction drawings so the concepts can get built. I realized early on in my career that clients really ultimately want the built finished landscape — not to put a colored rendering on the wall to hope and dream. That is why I am a design-build architect — I take the client from conceptual design through completed construction — all with a hands on approach to insure the integrity of the design. Although I emphasize the design of landscape projects, I am a licensed contractor ROC 192460 and build all of my own designs. 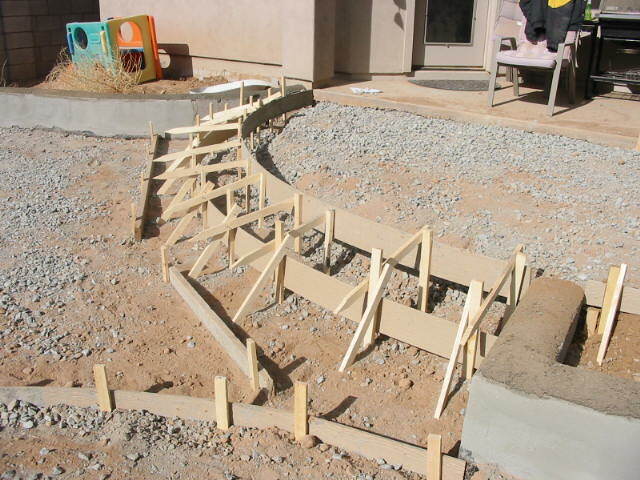 I also work with other specialists in Sedona who are experts at their trades including decorative iron, stone masons, carpenters, general contractors, pool builders and pond experts. Many homeowners are often faced with a project with multiple specialty trades but know of only their regular landscaper who is usually only capable of the maintenance aspects of a yard. Arizona law does not require a license to maintain landscapes, i.e. tree trimming, mowing, weeding, etc. but do require a license for any work that exceeds $750 which is then considered to be contracting. Thus most ‘gardener-landscapers’ are not licensed but do advertise they install pavers, walls, etc. which all could easily fall into the category of contracting . The benefit of using a design-build professional is that you are getting so much more value than if you talk with only the tradesperson directly and expect them to have an overall big picture — ‘landscape architectural sense’ of the property and how the individual components relate to and integrate with existing or future plans. Hiring multiple tradesman to do work one ‘project’ at a time usually results in a hodge podge — if not an in-cohesive design that only seems apparent after the fact. You should have a good handle on big picture thinking and a good sense of design if you intend to be your own general contractor/supervisor of the workers that you hire. Bottom Line: Your project may be straightforward like replacing an old concrete driveway with new pavers. You probably don’t need a design or any plans drawn. In this case, you are probably looking to get a free estimate. Where most homeowners make mistakes is when they have a larger project that may involve several components such as grading, irrigation, lighting, masonry and plantings — even for a very small area and rely on their gardener to give them design advice and a quote. What many homeowners do, is shop around several contractors to choose who comes up with the ‘best design for the best price’. This basically bypasses the design process as you are having several people prepare a design based on what they think you told them you wanted. If there is no set design, its like comparing apples to oranges in terms of best price. Don’t fall into the trap of getting several contractors to come out and give you a “free estimate” on something that is not pinned down in terms of design. Because I am aware of this tendency for homeowners to fixate on getting the work done, I do offer to provide a free proposal to do the work, but only after deciding that their project does not warrant a separate design. The purpose of my Complimentary Initial Consultation is to determine if you are looking for free estimates, whether you need a separate plan prepared, or perhaps just need some professional guidance.